German Spies in Britain, After the Battle, volume 35, Battle of Britain Prints International Ltd., 1982, page 20. Last year I wrote a short article review on After the Battle Magazine's classic piece on German Spies in Britain (Volume 11, published 1976). When the editor of the magazine, Winston Ramsey, wrote the article, MI5 files were still highly classified. As a result, some of the information gathered by Ramsey was not always accurate. 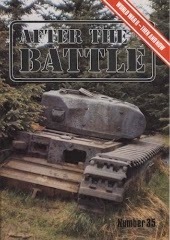 In Volume 35 of After the Battle Magazine, Ramsey acknowledged the limitations under which he had laboured in the mid 1970s. In 1981, military historian Nigel West wrote a book on the history of MI5 using information gleaned from interviews with some of the original MI5 officers and double agents. Based on the new information unearthed by West, Ramsey noted that Josef Jakobs had not, in fact, landed near North Stifford in Essex, as he had originally stated in Volume 11, but near Ramsey in Huntingdonshire. A revised Volume 11 was subsequently published. 4 out of 5 - It is always nice when authors keep readers updated on the newest, most up-to-date information.